New Rochelle, NY, June 12, 2018–A new study that compared six of the most promising adeno-associated viral (AAV) gene therapy vectors in human retinal organoid models showed clear distinctions in the efficiency of gene transfer to both retinal pigment epithelial (RPE) and photoreceptor cells. The results of this study can help guide future selection and design of viral vectors for therapeutic gene delivery and gene editing and are reported in an article published in Human Gene Therapy, a peer-reviewed journal from Mary Ann Liebert, Inc., publishers. (https://www.liebertpub.com/) The article is available free for download on the Human Gene Therapy (https://www.liebertpub.com/doi/full/10.1089/hum.2018.027) website until July 12, 2018. Robin Ali, University College London (UCL) and President of the European Society of Gene and Cell Therapy (ESGCT) and colleagues from UCL and University of Edinburgh, U.K. coauthored the article entitled "Assessment of AAV Vector Tropisms for Mouse and Human Pluripotent Stem Cell-Derived RPE and Photoreceptor Cells." (https://www.liebertpub.com/doi/full/10.1089/hum.2018.027) The research-ers demonstrated the feasibility of using human pluripotent stem cell-derived retinal or-ganoids as an in vitro test system for the development of gene therapy vectors. "One of the most widespread uses of human pluripotent stem cells in translational re-search has been to create well-differentiated living human tissues and organs 'in a dish' so that they may be used to test the relative efficacy of various drugs prior to their use in patients," says Editor-in-Chief Terence R. Flotte, MD, Celia and Isaac Haidak Professor of Medical Education and Dean, Provost, and Executive Deputy Chancellor, University of Massachusetts Medical School, Worcester, MA. "These studies by Dr. Ali have ex-tended that concept to the hottest application in gene therapy today, the use of AAV vec-tors in the eye." Human Gene Therapy, (https://home.liebertpub.com/publications/human-gene-therapy/19) the Official Journal of the European Society of Gene and Cell Therapy, British Society for Gene and Cell Therapy, French Society of Cell and Gene Therapy, German Society of Gene Therapy, and five other gene therapy societies, is an authoritative peer-reviewed journal published monthly in print and online. Led by Editor-in-Chief Terence R. Flotte, MD, Celia and Isaac Haidak Professor of Medical Education and Dean, Provost, and Executive Deputy Chancellor, University of Massachusetts Medical School, Human Gene Therapy presents reports on the transfer and expression of genes in mammals, including humans. Related topics include improvements in vector development, delivery systems, and animal models, particularly in the areas of cancer, heart disease, viral disease, genetic disease, and neurological disease, as well as ethical, legal, and regulatory issues related to the gene transfer in humans. Its companion journals, Human Gene Therapy Methods, published bimonthly and focused on the application of gene therapy to product testing and development, and Human Gene Therapy Clinical Development, published quarterly, features data relevant to the regulatory review and commercial development of cell and gene therapy products. 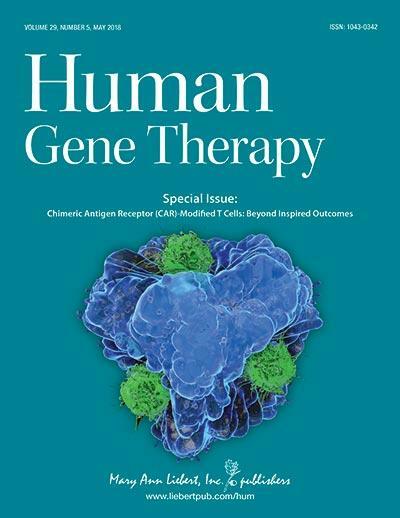 Tables of contents for all three publications and a free sample issue may be viewed on the Human Gene Therapy (https://home.liebertpub.com/publications/human-gene-therapy/19) website. Mary Ann Liebert, Inc., publishers (https://www.liebertpub.com/) is a privately held, fully integrated media company known for establishing authoritative peer-reviewed journals in many promising areas of science and biomedical research, including Nucleic Acid Therapeutics, Tissue Engineering, Stem Cells and Development, and Cellular Reprogramming. Its biotechnology trade magazine, GEN (Genetic Engineering & Biotechnology News), was the first in its field and is today the industry's most widely read publication worldwide. A complete list of the firm's 80 journals, books, and newsmagazines is available on the Mary Ann Liebert, Inc., publishers (https://www.liebertpub.com/) website.